Our pigs are slow growing rare breed pigs, which take longer to rear than commercial pigs and as a result they produce finer quality more flavoursome meat. Sausages and bacon are available through our on-line shop to accompany your Christmas Goose. In particular we recommend the traditional Christmas favourite the chipolata – a coarse ground pork sausage seasoned with salt, pepper herbs and spices, a thinner sausage which is great for breakfast or accompanying the Christmas feast, best cooked under the grill for a fabulous flavour. 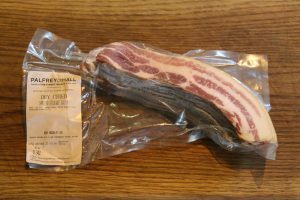 Our streaky bacon is a great accompaniment to the chipolatas for the very British festive favourite “pigs in blankets”, special packs available on-line. 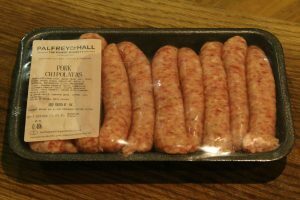 In addition a perennial favourite pork and apple bangers, a great sausage which is packed with flavour. By special order we usually have available a variety of pork joints for purchase as well as a limited supply of gammon including the fabulous Suffolk Black ! Contact us directly to enquire about availability and ordering.